It was the penultimate afternoon of our trip and the final river cruise we were going to take. Over the course of the week Guyana had delivered on so many levels. A country equivalent in size to the United Kingdom with a population of just 750,000. With approximately 80% of the country covered by pristine rainforest and less than 3000 tourists visiting a year I felt extremely privileged to have spent the past week in South America’s hidden gem. So far however, other than Trib, the giant river otter we’d seen at Karanambu’s rehabilitation centre, we hadn’t seen any in the wild so this was to be our final chance. Our base for the night was Rewa Lodge. The lodge is beautifully set in a clearing amongst the rainforest overlooking the Rewa river and is completely owned and run by the local Amerindian community meaning all profit it makes go back to the local people – something that’s common place throughout Guyana and one of the reasons it has one of the best tourism sustainability models of any country in the world. 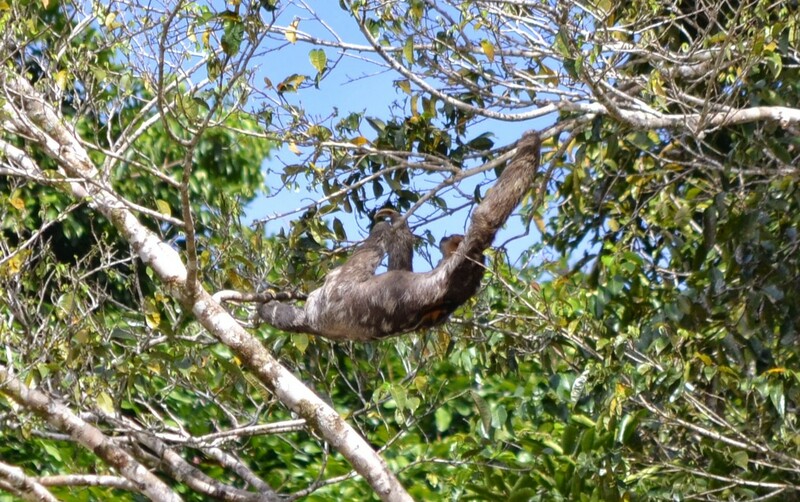 We’d already spotted an unusually active sloth earlier on that afternoon and had just spent the past 30 minutes paddling round one of the beautiful local ponds often frequented by fishermen keen to catch on of the country’s famous arapaima fish. We were now back on the river and heading upstream in our small motorised boat, the eagle eyed guide riding up front on the look out for any wildlife while the rest of us followed suit behind. 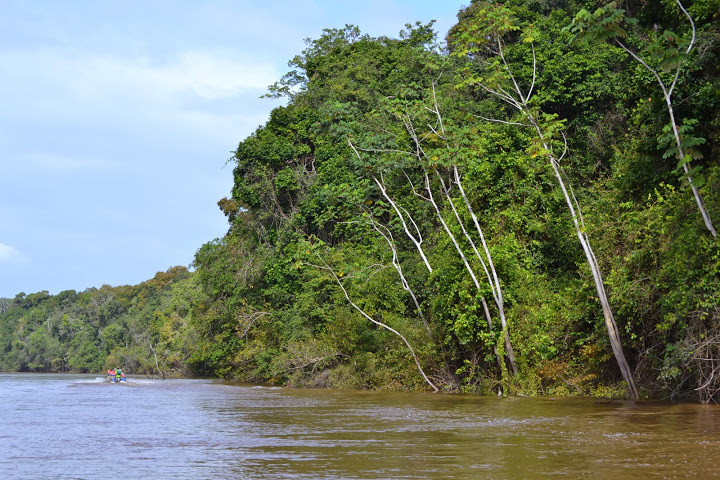 As we got closer to a large tree on the left hand river bank there seemed to be an unusual amount of activity with large numbers of yellow-backed cacique’s circulating frantically and making a huge amount of noise. 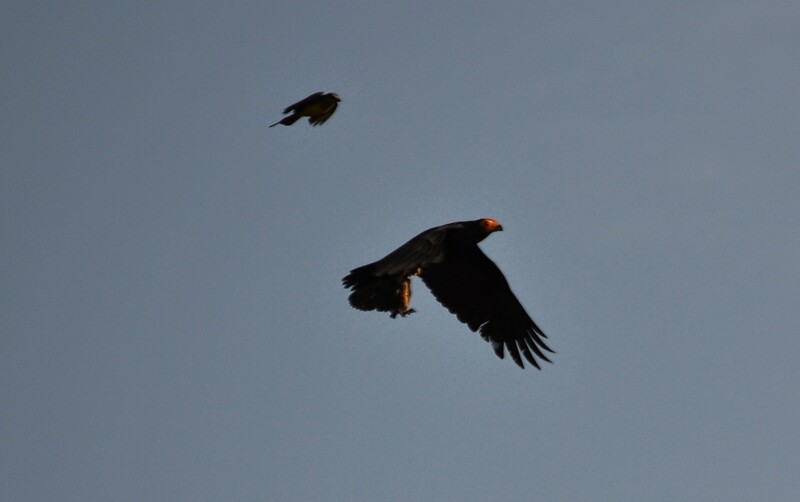 As we got closer it became clear their nest was under siege and the intruder was a black caracara. Before we knew it the caracara fled the nest with one of the young cacique’s wrapped in it’s claws. As it flew directly above us the 2 parents did everything they could to save their precious youngster, repeatedly diving and pecking at the flying caracara but all of their efforts were in vain. It had been a successful mission for the hungry caracara and a devastating blow to the cacique’s. A harsh reality of nature but a truly astonishing spectacle to see first hand..
As we gathered our thoughts and pieced together what had just happened the guide suddenly pointed to the river bank. He’d spotted a small group of river otters making their way upstream. The levels of excitement in the boat rose yet again as the driver navigated us towards them to get a closer glimpse. The inquisitive creatures had spotted us too and proceeded to make a huge amount of noise as the group of around 7 or 8 took it in turns poke their heads out and squawk at us. After following them up and then down the river bank 3 or 4 times we spotted a large fish leaping from the water and yet another chase was on! The group were clearly acting as a team doing everything they could to disorientate the fish and bag themselves a tasty meal for the day. Whether something suddenly put the otters off their stride or the fish just had a very lucky escape the chase suddenly came to an abrupt end. Having seen one kill for the day our only disappointment lay with the thoughts of the otters but it was fair to say they’d certainly put on another show for us. After a week of searching we had however finally got to see the otters in the wild. 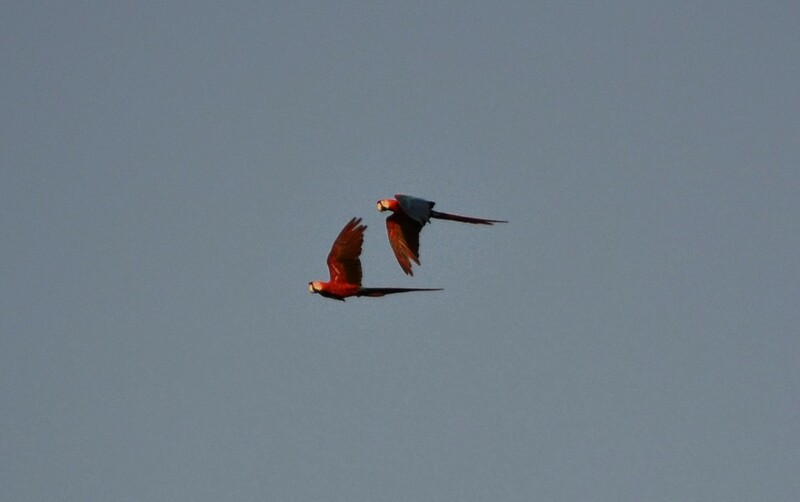 As if the events of the past 20 minutes hadn’t been enough for us to take in 2 squawking red and blue macaws then flew right above us . A minute later a toucan also followed suit and it was if the jungle had decided to put a show on for us! With the group now almost hysterical at the events unfolding around us the driver switched the motor off and we were suddenly floating back downstream and an air of calm suddenly took over. With the now familiar sounds of the jungle providing the sound track all around us, we all took a moment to reflect on the events of the afternoon and the week before that. Guyana really had delivered a truly magical experience and something that will long live in the memory. All I can say is go and discover for yourselves before the secret is out..